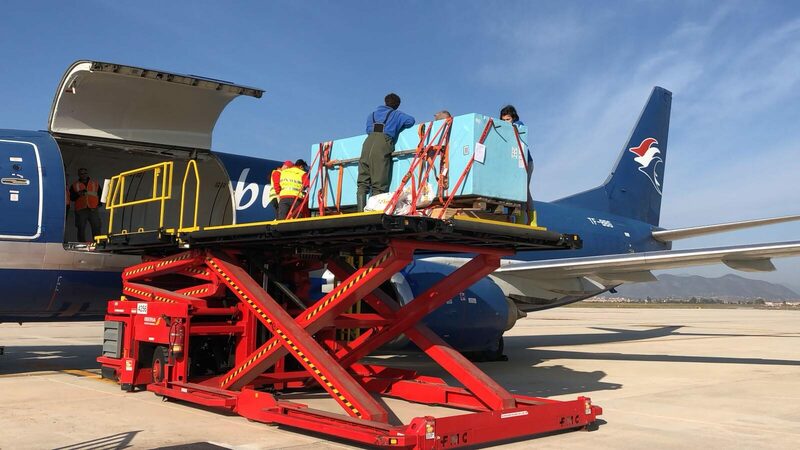 On 25 March Iberia Airport Services (IBAS) coordinated a very special operation involving the shipment of four dolphins to their new home in the Rancho Texas Lanzarote Park in the Canary Islands. To give them the best possible living conditions there is a programme called RAZA in which dolphins in captivity are placed in the environments most suitable to their characteristics. Under this programme the bottlenose dolphin Rocco, a 7-year-old alpha male in the southern Spanish city of Malaga, was covered with a special grease to prevent dehydration of his skin. He was carried on a soaking wet foam bed and accompanied by two veterinarians during the entire journey. The aircraft took him first to the Eastern coastal city of Alicante, where another three dolphins were picked up to be taken to the same destination. A group of IBAS employees was on hand to carry out the transfers under the watchful eye of the veterinarians, who constantly monitored the heartbeats of the precious cargo. Each carrying vessel weighed 1,800 kilos, and water was sprayed on the dolphins continuously during the trip. The dolphins landed safely on the island of Lanzarote and are now adapting to their new environment. Congratulations to the airport teams in Malaga and Alicante for their successful operations. IBAS is proud to be trusted with such delicate tasks!